How’s this for a glimpse of a lost civilization? It’s the interior of a 1870s ammo magazine Martini and other historians excavated last week near Fort Point, buried 20 feet below current grade. It had been backfilled in 1935 during construction of the Golden Gate Bridge. The water and flooded tunnel adds a nether-world type effect. 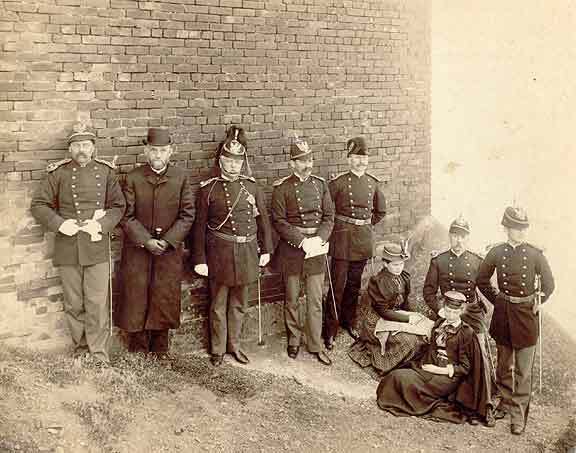 A group of Alcatraz officers poses gloomily outside the fort’s walls, circa 1893. All are wearing variants of the U.S. Army’s 1880s dress uniform. Their ornate epaulets reveal ranks ranging from 2nd Lieutenant to Lt. Colonel. The only individuals positively identified are the young officer at extreme right, 2nd Lt. George Gatley, and his fiancé seated next to him, Miss Bessie Crabbe. Standing directly behind Bessie is her stern-looking father, Capt. George Crabbe, an artillery officer assigned to the island for many years. To the left of Bessie is her close friend, the daughter of the post surgeon. The officer standing at left center is probably the island’s Commanding Officer, Lt. Col. Francis L. Guenther. The fellow with the naval-looking hat at extreme right is actually wearing a medical uniform; he was likely the “post surgeon” posing with his daughter. The cleric is something of a mystery. Perhaps a chaplain? There’s also romance in this photo. Lt. Gatley met Bessie Crabbe while he was stationed at the Presidio. They courted for many years and eventually wed in 1896. Their great granddaughter is the owner of this photo. We’ve created a separate page for this first-person visit to the army prison by an artillery lieutenant, from The Illustrated American. J.M. Neville, Sheriff and Provost Marshall of Solano County, arrested in Benicia yesterday a notorious Secessionist named Major McKay. This obese man, from the time of his coming to California seventeen years ago, up to the advent of the present administration, has held either Federal or State office. 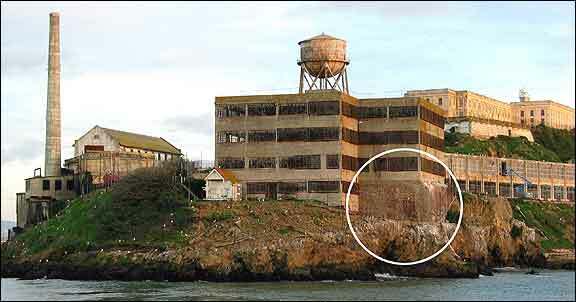 For a number of years he was an employee of the Quartermaster’s Department at Benicia, and subsequently had a fat office at San Quentin under the Weller dynasty. McKay has on every occasion intruded his disunion sentiments on loyal hearers, and is universally regarded in Benicia by all loyal men, with scorn and contempt. A pensioner on the bounty of Uncle Sam, he lost no opportunity of villainizing the country which has kept him from being a public pauper. He has got to the end of his rope, thanks to the vigilance, preparedness and fearlessness of Marshall Neville. The circumstances of the arrest are these: Soon after noon yesterday, whilst McKay stood on the street, in Benicia, talking violently, as ususal, Neville stepped up, and tapping him on the shoulder, said, “Major I want you to go up to the Colonel at the [Benicia] Barracks.” “What for?” “To take the oath of allegiance,” replied the Marshall. When brought before that officer he refused to take the oath, saying that he would go to jail first. The Colonel, unintimidated, passed him over to the tender consideration of a guard of two soldiers, who marched their prisoner down to the boat. He arrived here safely and was ensconced in the very plain quarters of the Provost Guard Rooms, last night. Today he will be transported to the healthful but breezy atmosphere of Alcatraz Island, where he can ruminate, ad nauseum, and chew the bitter end of treason. He is the first of a long line of traitors who will go “marching on” to that desolate Gibraltar, from his own neighborhood, unless they heed the lesson so summarily taught them by keen-sighted and dauntless Marshall Neville. Have you seen this cover on some of the publicity materials and websites featuring FORTRESS ALCATRAZ? It’s an early mock-up of the proposed cover that was not used on the final product.